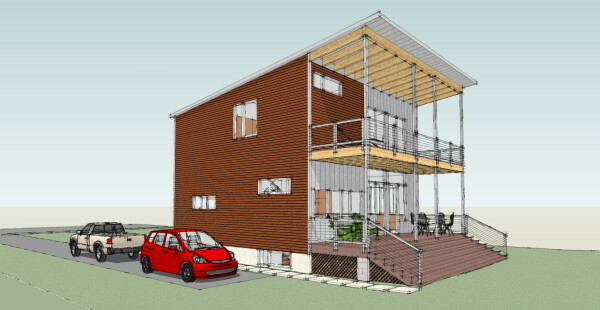 Its not a house design - its a platform for making house designs. Does that make sense to you? 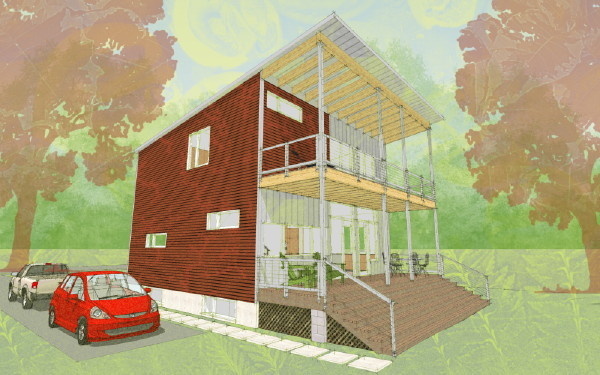 We are designing houses here, yes, but more so, we are designing a way to make houses. If done right it becomes something that anybody can run with, something that spawns results that we will never imagine. With a limited number of predesigned modules you can create floor plan variations at a factor of 3-4 for a given house design - or Schema as we are calling them. Working with a dozen module types we can easily create 40 or more different houses, some with subtle differences, some with great differences. And that is without resorting to simple variations such as mirrored floor plans. The dozen modules designs are based on slightly smaller set of 9 modified container boxes. Different fit-outs are possible within the modifications made to a given box which can yield multiple modules designs for a single set of box modifications. Owners can choose to create their own module fit-out within one of our standard modules expanding the range of possibilities. Central to this is that we only need a limited number of physical modifications to the boxes to create the modules. They can be pre-engineered, calculations packaged and ready for permit applications simplifying the typically uncertain road for permitting this unusual construction. 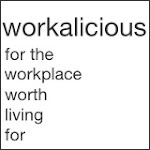 It reduces the set of modules to a manageable set of stock boxes, so much so that a vendor could even keep inventory. So now some improvement can be made over the every house custom merry-go-round, and one-off boxes and design work that goes along with it. Yet you are not locked into a limited number of house designs. Its a system designed for production. Ok, raise your hand if this is starting to sink in. 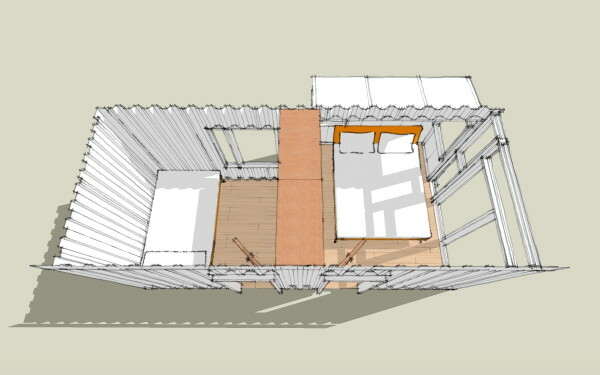 Continue reading "LamiDesign IBU Building System - not a house, a platform"
A two bedroom module - a master bedroom with a pop-out and a secondary bedroom. I know that is the smallest master bedroom you've ever seen - barely room to walk around a bed. Here is the thing - this can always be used with another larger master bedroom module just to make one of the other bedrooms larger. Maybe you are making a vacation house and having room for guests, or in-laws, or grown children is the priority. Maybe small bedrooms to sleep guests and larger living areas are the priority. Or maybe you just realize that you do little more than sleep in that room so why put any more space there than necessary. With our rational system of predesigned modules its up to you - you can combine units to make the kind of accomodations you need, whether its a full time residence or a weekend house with room for guests and fun. 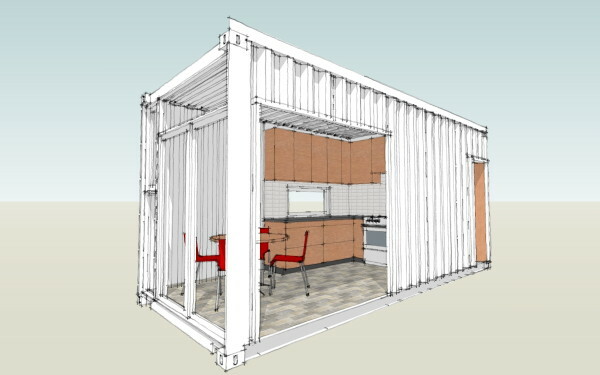 There are lots of people proposing and/or building container houses out there in the big wide internet. None use the inherent modularity of containers this way. Nobody gets it the way we do. This modular system is why it makes sense to build with these - to leverage them to empower you to make the house you want, the house that fits your life. 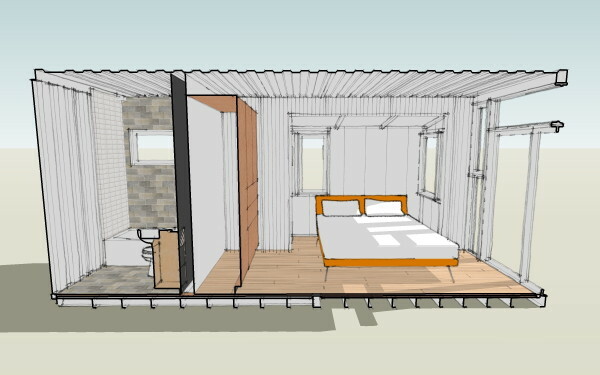 Continue reading "LamiDesign IBU Building System - a two bedroom module"
Continue reading "LamiDesign IBU Building System - a bedroom looks like this"
Its time. I'm mocking up the modular units shown in our past design studies. Continue reading "LamiDesign IBU Building System - mocking up modules"
A more detailed description of the progress can be seen on the owner's blog. Link, and a photo browser after the jump. Continue reading "3030 House - new interior images"
The XHouse2 is posted to the online catalog, and Design Prints are avaialble immediately. Construction Prints will be coming in the near future. Continue reading "getting the show on the road - XHouse2"
Fist image of interior view for the new XHouse2 design. 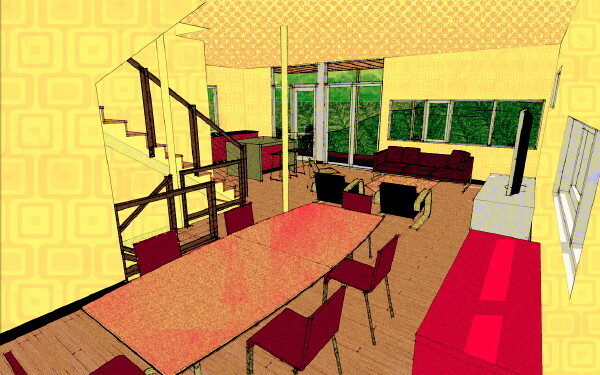 A similar treatment to the XHouse1 drawings, but rather than the organic textures I am using on the exterior views this time I am focusing on some funky retro patterns for the wall and ceiling. Continue reading "inside the XHouse2"
Working through the exterior images now. 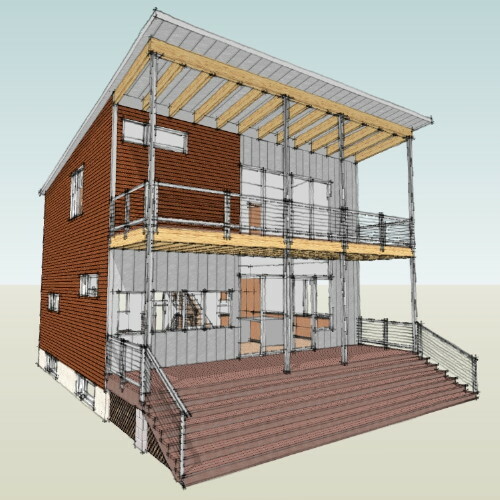 Yes, it is a similar look and feel to the XHouse1. At least the first couple of houses in the XHouse collection will have this look for the renderings, although the houses will vary. Later when I have a breather I can experiment with the rendering tools more and branch out. Right now I have to get better with the interiors. I was not satisfied with those on the XHouse1 and hope to do better this time. 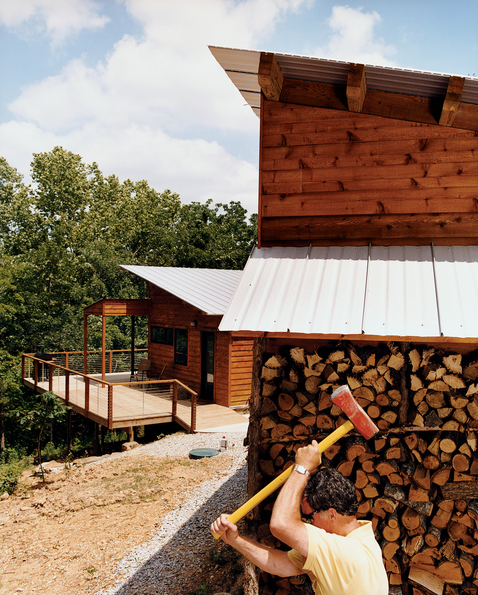 Continue reading "Design Prints begun - XHouse2"
Back in 2006 Dwell Magazine published an article about our customer who built a Plat House in Arkansas. The article is now also on Dwells new and expanding web site. 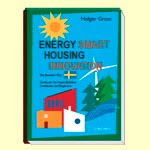 Photo above is from the Dwell web site and also appeared in the article is by Daniel Hennessy. There are a few more photos on Dwell's site in a slideshow - don't miss them. 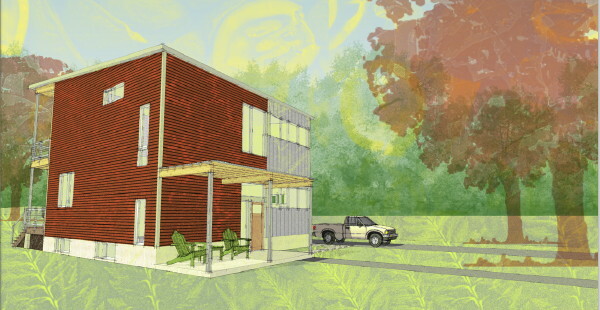 Continue reading "Plat House on Dwell Magazine's web site"
Its time to do that painting thing over the 3d image exports. I have to see if I can recreate the same look I used on the XHouse1. Same look, smaller size. I've downsized the rendering's automobile aspirations too. No Audi this time. Its a Honda Fit, and a Chevy pickup in honor of GM's bankruptcy. 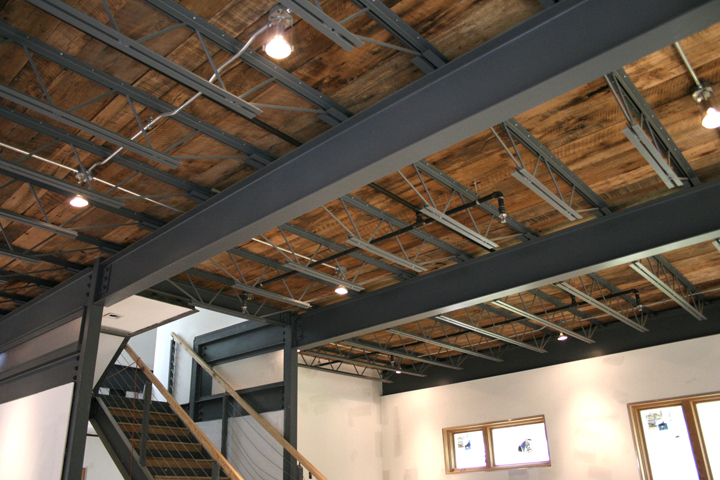 Continue reading "In the ground - XHouse2"
Today we received a few new photos of the Massachusetts Plat House project from EcoSteel. It is far along from the last update we got and its amazing to see it all closed in with windows, looking very much like the Plat House. Please click through to see a few more photos in a photo browser. 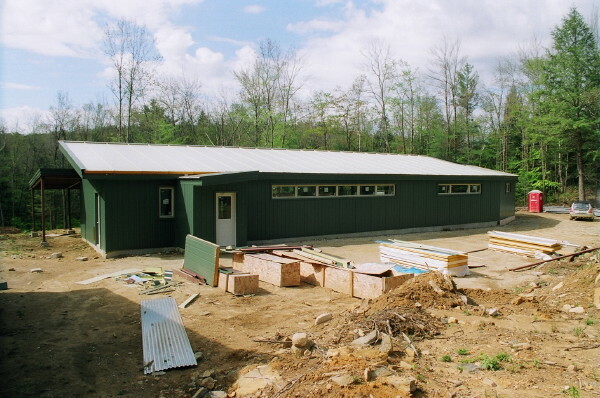 Continue reading "Massachusetts EcoSteel Plat House update"
Continue reading "House model complete - XHouse2"